Salina, the county seat of Saline County, is in the center of the state. With a population of around 50,000, the city has a thriving arts community, a fine library with a collection of Kansas Literature and History, and a good public school system. The annual Smoky Hill River Festival, held in early June, has been ongoing for over 35 years. Educational institutions include Kansas Wesleyan, where Ben Fuson, one of the earliest bibliographers of Kansas Literature, taught in the English Department. 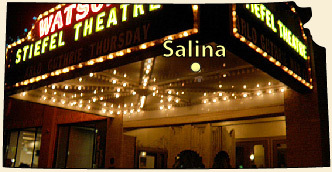 The Salina Art Center hosts film, art, poetry, and an Artist-in-Residence program. Poet Harley Elliott is also a visual artist, who once taught at the now closed Marymount College. Patricia Traxler has lived and worked in Salina for many years. Don Wagner, who lives in nearby Bennington, has taught at the high school and inspired many students to read and write poetry. Gloria Zachgo won a 2012 Writer's Digest Award for Self-published books.